During the summer of 1953, Canadian television was a very new thing. 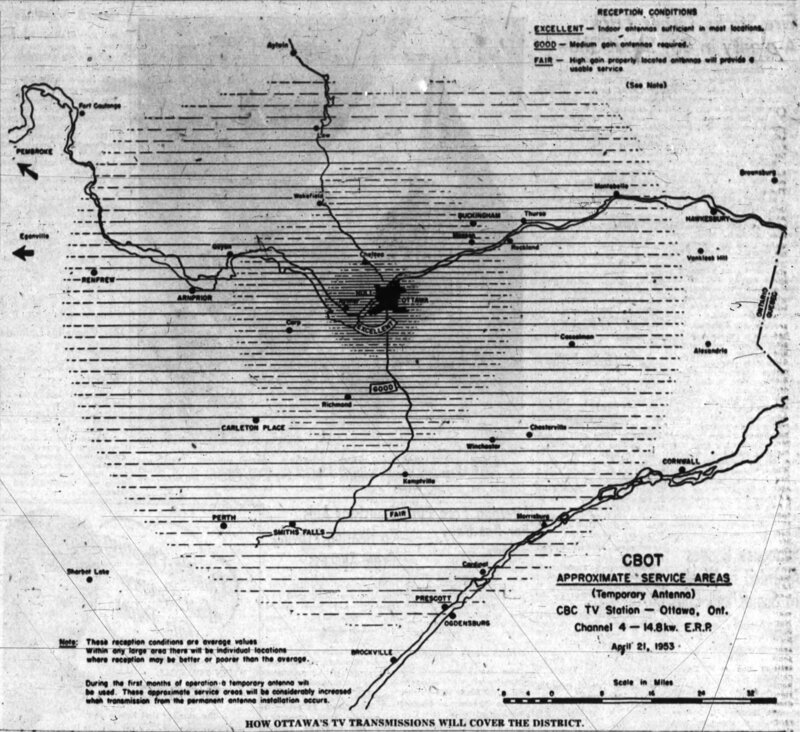 Although it is a fact that large swaths of Canadians were able to pick up broadcasts from the United States before CBLT and CBFT signed on in 1952 (CBOT, CBC Ottawa signed on June 2, 1953, in time for Queen Elizabeth’s Coronation), the television revolution on both sides of the border only really took off during the early 1950s. As with the early development of any new industry, new entrants quickly flood the market and fold as quickly as they appear. Those of us who experienced the late 90s in computing are familiar with this pattern. 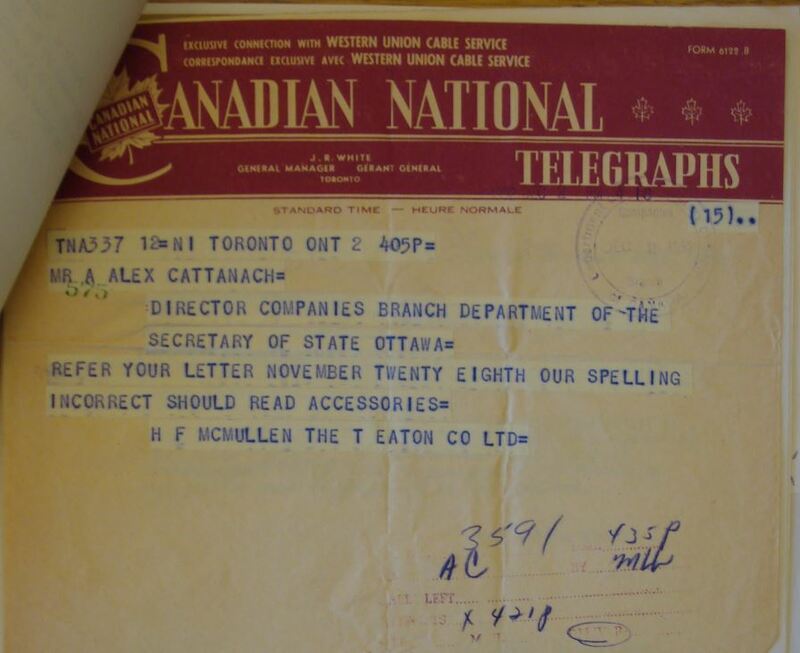 In the weeks and months leading up to CBC Ottawa (CBOT) signing on, the papers prepared Ottawans for what they could expect. The manufacturers of televisions advertised heavily as well. Source: Ottawa Journal, May 9, 1953. Goad’s (1956) depiction of the property. I was recently looking into the story of today’s 190 Somerset W (the office units above the White Cross Pharmacy on Elgin) and came across the Video-Aire Company, sellers of television sets. Once I was sucked into the world of television sales in the 1950s, those offices were put on the backburner. 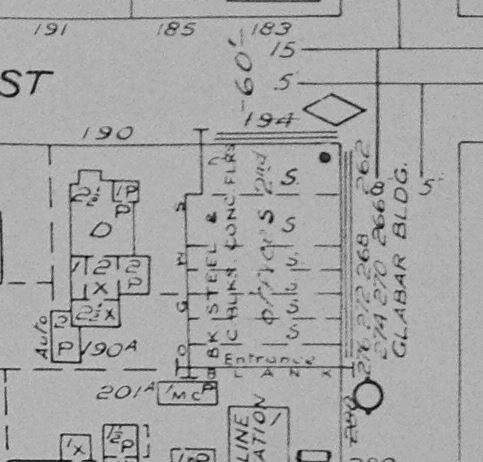 Looking at the 1956 Goad’s fire insurance atlas, 190 Somerset W was the number of the property behind that commercial building: the site of a small walk-up (and law office). 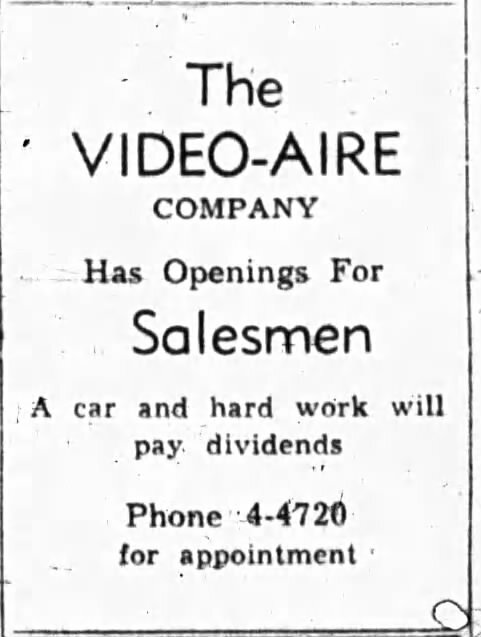 During the Spring and Summer of 1953, the Video-Aire Company advertised frequently in the pages of the local papers. 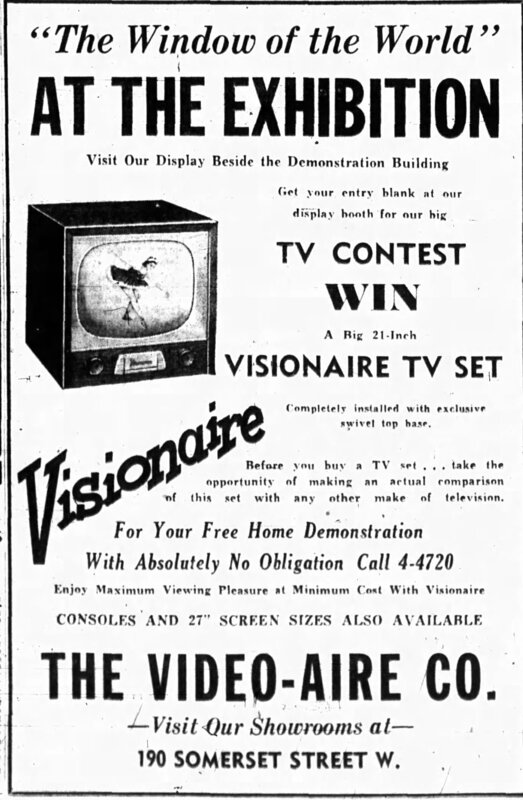 They even ran a draw to win a 21″ Visionaire television set (valued at $359, or about $3100 today) if you were to simply visit their display beside the Demonstration Building at the Ex. Not only would you win the television, but they promised to also throw in installation and include their exclusive swivel-top base. The contest advertisement. Source: Ottawa Journal, August 21, 1953. 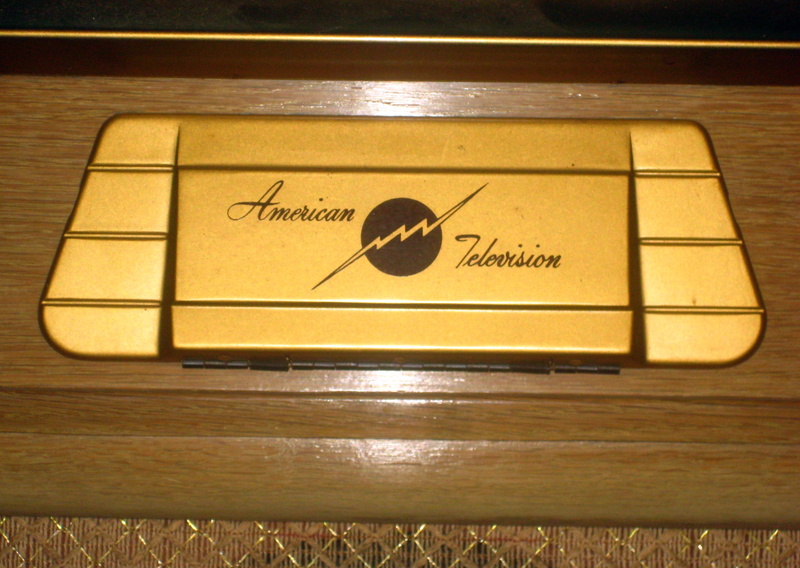 Interestingly, Video-Aire’s advertisements did not actually mention the company behind the television set. 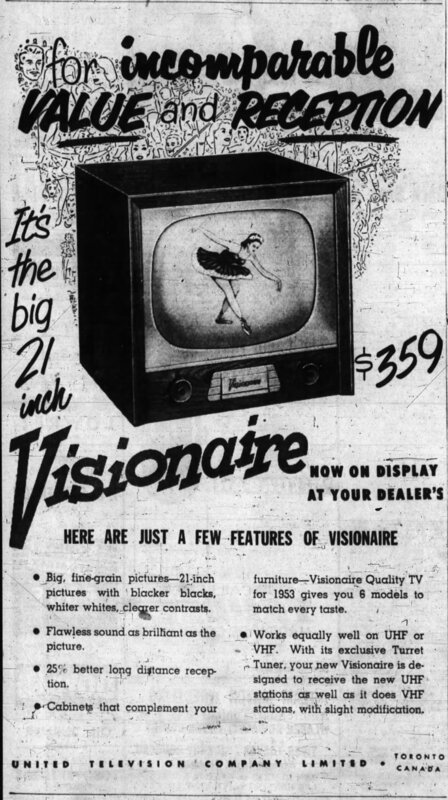 Other advertisements for the Visionaire found in local papers show that it was a product of the United Television Company in Toronto. The television itself, however, seems to have been a re-badged/reconfigured version of US company Gotham’s Visionaire set. 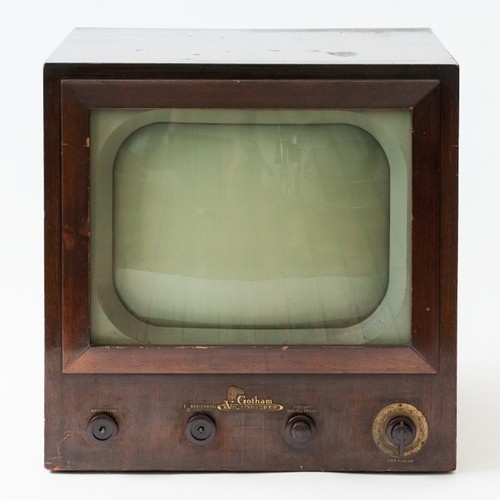 Like United, Gotham itself did not endure manufacturing televisions, lasting only from 1950 to 1958. Gotham’s president, Harold Shevers was involved with Avery Fisher’s radio equipment company during the 1920s and Gotham would eventually be bought out by Fisher. United Television’s advertisement for their 21″ Visionaire. Source: Ottawa Journal, May 26, 1953. Because I will normally take the chance to visit Library and Archives when I can, I decided to take a look at the files that were held by the old Ministry of Consumer and Corporate Affairs on the United Television Company. Almost as soon as the ink was dry on final draft of their Letters Patent, dated November 24, 1952, things already appeared somewhat doubtful. Indeed, by the late Spring of 1954, United Television had declared Bankruptcy. United Television Bankruptcy liquidation of assets. Source: Globe and Mail, August 24, 1954. 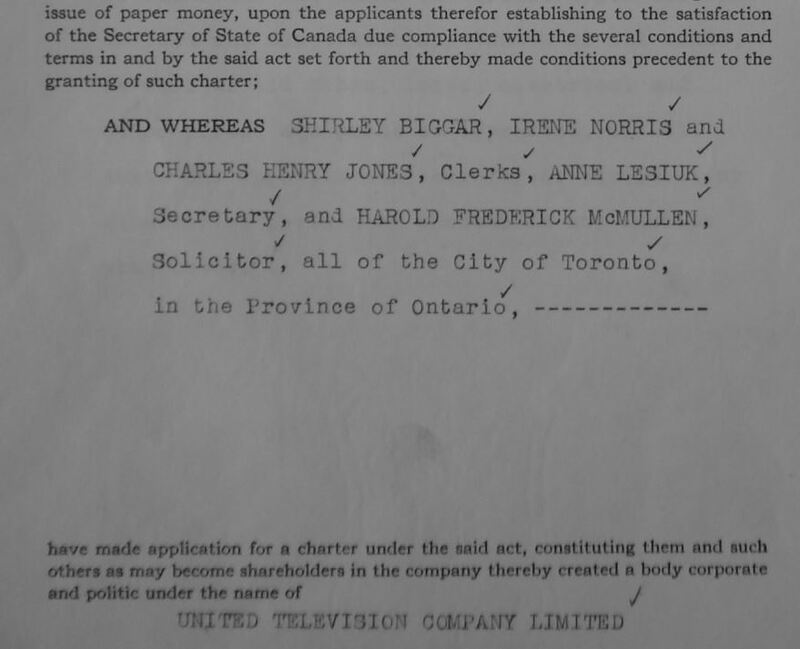 Of the individuals named on the Letters Patent – Shirley Biggar, Irene Norris, Charles Jones, Anne Lesiuk, and Harold F. McMullen, I have only been able to find any information about McMullen. McMullen, who died in 1963 was a member of Eaton’s legal team, and was indeed through the entire United Television project. All correspondence between him and then Secretary of State Frederick Bradley was addressed to him at 190 Yonge: Eaton’s headquarters. I do not intend to imply any relationship between Eaton’s and United Television, however. 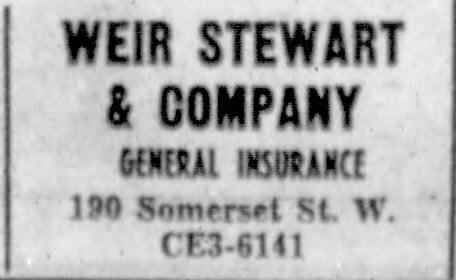 Weir Stewart & Company took over the space in 1955. Source: Ottawa Journal, May 24, 1957. Video-Aire’s fortunes appear to have been tied to those of United Television as well. For the remainder of the 1950s, until the building on the premises was demolished to make way for the walkup (c. 1960), the space was first leased by an establishment that sold suits, and by 1955, Weir Stewart & Co. General Insurance took over the space. Unless there was a significant chunk of Ottawa using 110 volt DC power, I doubt the Canadian Visionaire was in any way related to the Gotham Visionaire. The latter is very unusual and unique in that it is a true AC/DC set. It was specifically designed for sale in Manhattan, where there were still many DC customers in the early 50s. But that control door sure looks familiar: http://tvontheporch.com/images/img_7257.jpg Perhaps the Canadian Visionaire sets were actually rebadged DeForest/Sanabrias? Thank-you so much for your clarification! DC is certainly a disqualifying fact for that idea. I’ll dig in a little more and update soon.